from Riverford Farm: Recipes for Everyday and Sunday, p.
A box of vegetables from Riverford Farm in Devon arrives every week at my home-away-from home in London. In the US, we would call RF a Community Supported Agriculture (CSA) company, in other words, a service that delivers organic produce to the homes of subscribers. The smaller scale of the United Kingdom allows Riverford to scale its operations closer to a nationwide enterprise than CSAs can do in the States. At least, people in southwestern, northern and midlands England are within a Riverford Farm’s range (as far as I can tell, only Kent in England is out of luck). The box that arrives with seasonal produce also includes attractively-printed, hole-punched recipes that subscribers can compile over time. After I tried a number of them when I had a chance to cook for myself in London, I knew I wanted their collection of recipes when it came out. The recipes are not particularly fussy, on the homey side, and substantial. Imagine my pleasure when a copy of the newly published book arrived as a birthday gift not long ago. I dove right into the contents. Numerous dishes jumped right into my line of sight: Cabbage, Bacon, and Potatoes; Sausage Stew with Celeriac and Kale; Roast Saffron Potatoes with Almonds and Bay; Lamb Cooked in Milk and Fennel; Spaghetti with Fresh Tomatoes and Almond Pesto. One drawback to the book, which is common among cookbook writers who stress seasonal ingredients in their cooking is that Riverford Farm has organized their recipes according to month. Nigel Slater’s wonderful Kitchen Diaries is similarly organized. There is no question that I tend to look through cookbooks in line with the season, but more often the gardener in me wants to thumb a book according to what I have on hand to eat from my garden. After all, seasonal produce here in northern California doesn’t match seasonal produce elsewhere in the U.S. much less in the UK. It seems short-sighted to assume one climate among a cookbook’s readership. But that’s a small cavil. 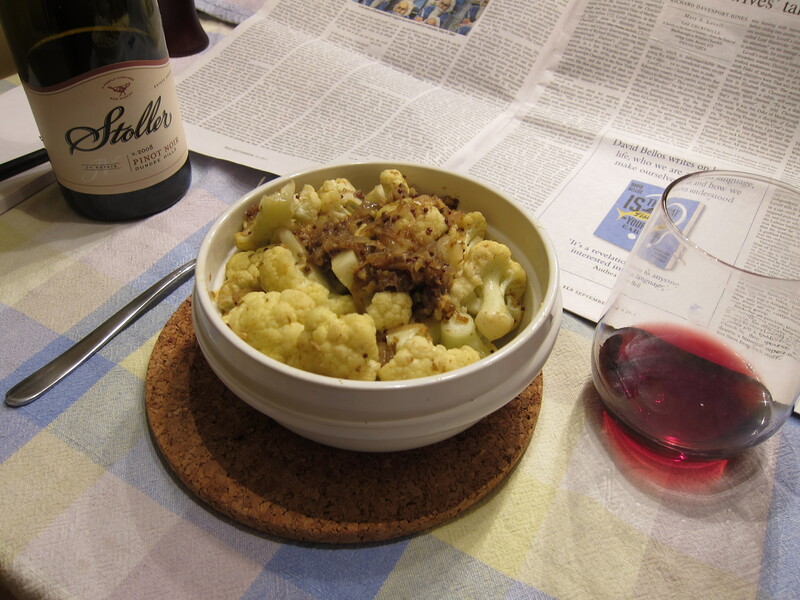 This recipe for spiced cauliflower was the first recipe I made from the book. Lately, all I desire for dinner is one simple dish and a glass or two of wine. 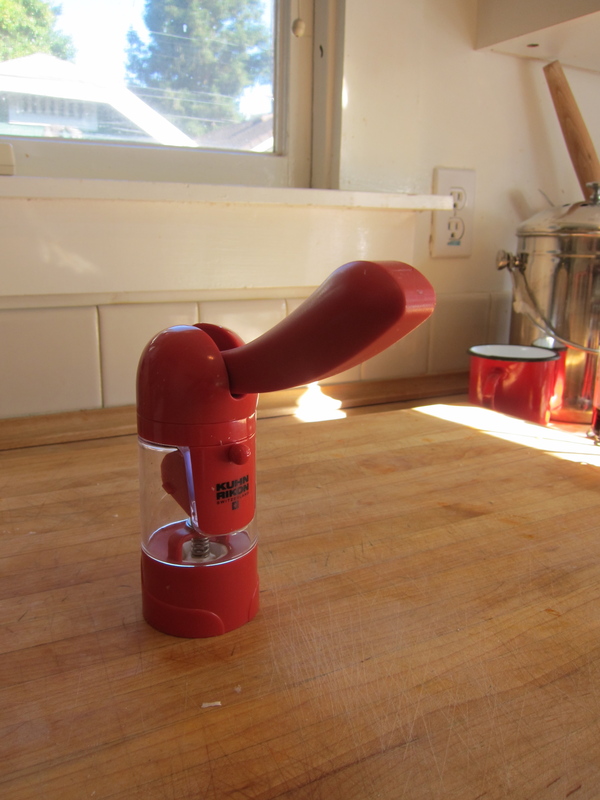 The spices in this recipe gave me an opportunity to use another birthday gift, a brilliantly designed spice grinder that has quickly become an essential tool in my kitchen. The flavor of freshly ground spices surpasses spices already ground when you buy them. I’d never seen a spice mill like this one before a friend gave it to me. It’s made by Kuhn Rikon and available at Sur La Table for about $20. I’ve used it for all sorts of spices. My cooking friends don’t know yet that this Rachet Mill, as it’s called, is in their future. I like supporting companies that offer competition to Williams-Sonoma. Sur La Table may have stores all over the west coast, but I understand it still struggle for survival. If I had had the energy to make basmati rice to eat with the cauliflower, I would have done so. Shadowcook: HA! Sorry, I can down an entire medium-sized cauliflower. You can, too, no doubt. Shadowcook: If you buy one of the rachet mills I provided a link to above, then use whole seeds and grind right into the butter in the pan. Heat the oil and butter in a pan large enough to hold the cauliflower in one layer. Add the spices, onion, garlic, and ginger to the pan. When the mustard seeds start to pop quickly add the cauliflower, stirring vigorously. Add the sugar, season well, cover and reduce the heat. Leave for 10 minutes on a gentle simmer. Cover, and check the cauliflower is tender. Stir again, cover, and remove from the heat and leave to finish cooking for 10 minutes in its own steam. Shadowcook: Don’t overdo the sugar. And you’ll be surprised at the liquid generated by the ingredients. Just watch to make sure the spices don’t burn.